If you just can't get enough of the 2011 Audi A8, we've got your fix. Audi has issued a new press release on the 2011 A8 today. In Rupert Stadler's words “The new Audi A8 is the sportiest sedan in the segment." Also, be sure check out the video after the jump for nearly 9 minutes of footage ranging from driving scenes to an in-depth look at the new A8's interior. AUDI AG RELEASE: SOME INFO DOES NOT APPLY TO THE U.S. MARKET. Fascinating sportiness, innovative technology and superior comfort: Audi is bringing the next generation of the A8 to the starting line. The new flagship demonstrates the brand's clear Vorsprung durch Technik with its light aluminum body, its powerful and highly efficient engines, the improved MMI control system featuring a number of innovations and an elegant interior with a craftsman’s level of fit and finish. The A8 also sets new standards of efficiency. The fuel consumption of each of the engines available has been substantially reduced by as much as 22 percent. The 3.0 TDI with front-wheel drive to follow later emits only 159 grams of CO2 per kilometer (255.89 g/mile), and with 6.0 liters of fuel per 100 km (39.20 US mpg), it boasts the best fuel economy in the luxury segment. The new luxury sedan, to arrive at dealerships in early 2010, is a technical work of art combining sportiness and progressiveness. Its elegant and powerful body is an aluminum Audi Space Frame (ASF), weighing about 40 percent less than a comparable steel structure. The new full LED headlights, which use light emitting diodes for all light functions, are a completely exclusive high-end solution on board the new A8. They give the luxury sedan an unmistakable appearance even in daylight and even more so after the fall of darkness. The revolutionary optics used in these headlights mean a departure from the tubular light modules commonly used today. The full LED headlights herald a new chapter in the history of lighting technology. The interior enchants with new, even lighter lines, uncompromising quality of fit and finish and extraordinary attention to the smallest of details. The comfort on board is first class – from new, emotionally charged ambient lighting to the luxurious adjustable rear seats. 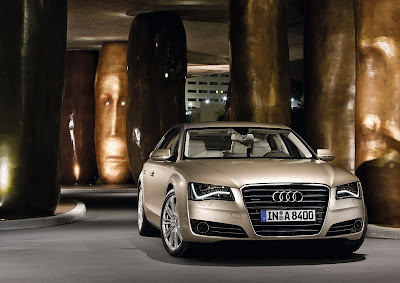 The Audi A8 combines a new level of technical intelligence with exemplary and easy operation. When combined with the optional navigation system, its Multi Media Interface MMI includes a pioneering innovation: the MMI touch. This MMI touch system enables the driver to control many functions intuitively; for example, the navigation destination can be entered by tracing the letters on the pad with a finger. MMI navigation plus is networked in a novel fashion with the advanced driver assistance and safety systems. It reads the road ahead in the navigation data and provides this information to the control units for the automatic transmission, the headlights and the intensely refined Audi adaptive cruise control with stop & go function. The improved intelligence of these systems allows them to recognize complex scenarios and make anticipatory decisions to support the driver. In many situations, the new Audi pre sense safety system can mitigate accidents and their consequences. Other novel additions are a night vision assistant that highlights detected pedestrians and, coming in the course of 2010, a speed limit indicator. The new A8 will initially be offered with either of two engines, a 4.2 FSI with 273 kW (372 hp) and a 4.2 TDI, packing 258 kW (350 hp). These will be followed a short time later by a 3.0 TDI with 184 kW (250 hp), which is a completely new design. The output and torque of all engines have increased, while fuel consumption has decreased considerably – by as much as 22 percent thanks to intelligent efficiency technologies such as the recuperation system and the innovative thermal management. A second variant of the 3.0 TDI will follow at a later date. It provides 150 kW (204 hp) of power, drives the front wheels and consumes only 6.0 liters per 100 km (39.87 US mpg) in the EU driving cycle. That corresponds to a CO2 emission rate of 159 grams per km (255.89 g/mile) – a value hitherto unattained in the luxury segment. The standard new transmissions also play a large role in increasing efficiency – the extremely convenient 8-speed tiptronic finely graduates its eight gears while achieving a large overall spread. Its control system is purely electronic, operated with an elegant selector level and rocker switches at the steering wheel. The quattro permanent all-wheel drive has a distinct sporty and rear-end character. On request, the sport differential dynamically distributes the forces between the rear wheels; on the A8 4.2 TDI this feature is standard. The new A8 also documents its standing as the sportiest luxury sedan on the market in the chassis sector. The wheel control arms are made of aluminum. The adaptive air suspension with controlled damping is standard equipment and is integrated into the Audi drive select dynamics system. The optional dynamic steering is a supplementary component. Audi also offers a number of attractive multimedia modules, from rear seat entertainment to advanced multimedia services. Audi can look back on a rich history in the luxury segment. Audi and Horch, which was later to become its sister brand and at the time was based in Zwickau, Saxony, were already building large cars with eight-cylinder engines in the late 1920s. One of these was the Audi Type R, also known as the Imperator. Its 4.9 liter inline eight-cylinder engine generated 74 kW (100 hp) and 275 Nm (202.83 lb-ft) of torque. In 1988, Audi undertook a new and successful attempt to establish itself in the luxury class. The large sedan with the name V8 was equipped with an eight-cylinder engine initially produced 184 kW (250 hp), which was increased to 206 kW (280 hp) in the second version. quattro permanent all-wheel drive – a first in the premium segment – was already standard. The first-generation A8 (1994) marked the first use of the aluminum ASF body – a technological breakthrough – in a series-produced vehicle. Audi further extended its lead with the second-generation A8 (2002) with the adaptive air suspension and the innovative MMI control system. The single-frame radiator grille – the new face of the brand – followed in 2003. The 2.8 FSI with the Audi Valvelift System for the variable control of valve lift improved efficiency even further. This version of the A8 set new standards, with its CO2 emissions of 199 grams/km (320.26 g/mile) being best-in-class. Audi has been aggressively driving progress in the luxury class for many years now.